The Spin a Mini giveaway started a couple of weeks ago at PlayOJO, and you can still get a piece of the weekly £25,000 prize pools. Play at least 100 spins on the game of the week for a chance of winning a Cooper Mini, mega spins, flight tickets and much more! The selected game of this week is Spinning Wilds. Find it in the casino and play 100 real money spins on it before the 30th of December in order to get an entry into the slot tournament, and come back after 14:00 GMT the following day to play your tournament spins. All you need is some luck in order to get to the top of the leaderboard! The Mini Cooper is a very popular car due to its small size which makes it a perfect city car. 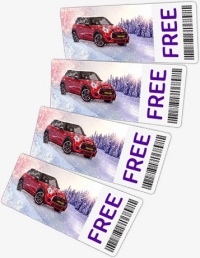 Prizes worth a total of £25,000 will be handed out in each weekly promotion, and a brand new Mini Cooper is the first prize in each competition. But if you finish among the top 50 players you will also have a reason to celebrate, as PlayOJO has prepared some fantastic follow-up prizes this time around. The second place winner will get flight tickets for two to anywhere in the world, and the third place prize is a Samsung 75-inch 4K Smart TV. You can also win an Amazon gift voucher worth up to £200, or a nice bag of mega spins or super spins. A list of all the prizes are available at PlayOJO, so visit the promotion page to learn the full details. The final week kicks off at the 31st of December, and the game of the week will be Pink Elephants from Thunderkick!